The participants of the 12th Philippine Sudoku Super Challenge (PSSC) can now sneak a look at the similar puzzles to come out in the PSSC national finals which will be held at SM North EDSA on January 27, 2018. 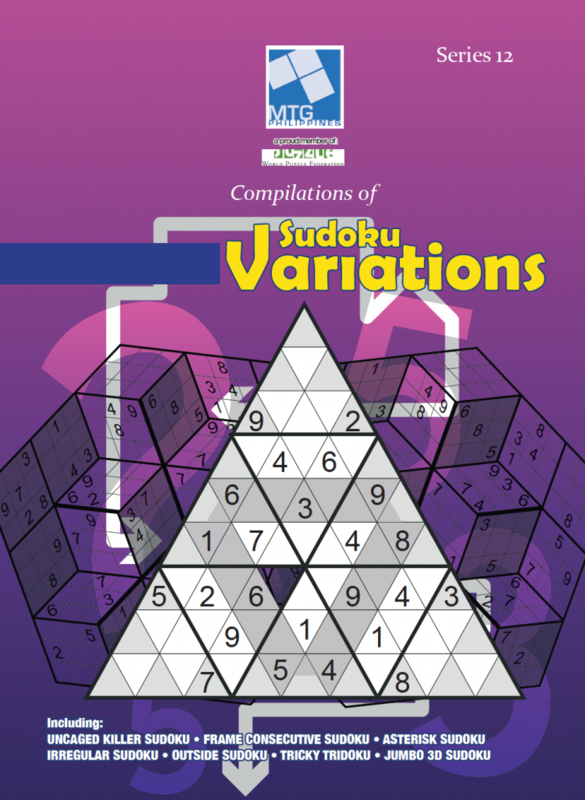 The MTG Philippines, a member of the World Puzzle Federation has launched the Series 12 Compilations of Sudoku Variations which presents the type of Sudoku puzzles that will appear in the national finals of the 12th PSSC. The latest series flaunts twenty-two kinds of Sudoku puzzles of which eight are definitely new to push one’s expertise to the limit and even beyond the limit. The new Sudoku puzzles in this series are Frame Consecutive Sudoku, Addoku, Tricky Tridoku, Irregular Sudoku Mix, Diagonal Odd Sudoku Mix, Asterisk Sudoku, Killer Uncaged Sudoku and Jumbo 3D Sudoku. The puzzles are perfect to hone one’s skills in preparation for the forthcoming 12th PSSC and very ideal for those who train themselves to be future participants of the PSSC.